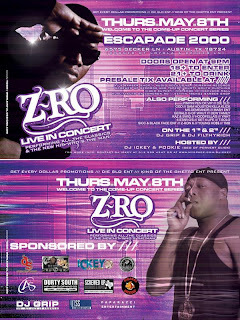 From the borderline Austin City Limits department... Z-Ro @ Escapade 2000 on May 9th. I would list the other artist on the ticket, but unfortunately I can't read the font on the flyer. I can make out Pimpin Pen and Gerald G.
Man the Indiana primary is more exciting than the NBA Finals! Joseph Wayne McVey (born June 6, 1976) better known by his stage name Z-Ro, is an American rapper from Houston, Texas, known for his "up-from-nothing" rise to fame, flexibility in rhyme and extensive collaboration with other rap artists and musicians. Z-Ro's popularity has increased rapidly, as he has been featured on Bun B's single "Draped Up" with Slim Thug, Paul Wall, Chamillionaire, Mike Jones, Lil Flip,Lil Keke,and Aztek Escobar and also on Chamillionaire's "Won't Let You Down" featuring a plethora of Houston-based rappers. Before being incarcerated prior to the release of I'm Still Livin', Z-Ro stated in an interview that the album would be his last. This statement was later retracted after the 2007 release of his mixtape Power. Recently, in an interview on Houston radio station 97.9 The Box, Trae confirmed that he and Z-Ro would be releasing another ABN album titled "It Is What It Is", Sometime during late June or early July. Rumors have also been circulating that Z-Ro will be releasing another album after the ABN album titled "Cracc" in Mid/Late 2008. Z-Ro says he gave it that name because of 2 reasons; all the hard work he put into the album and because he was addicted to working on it.